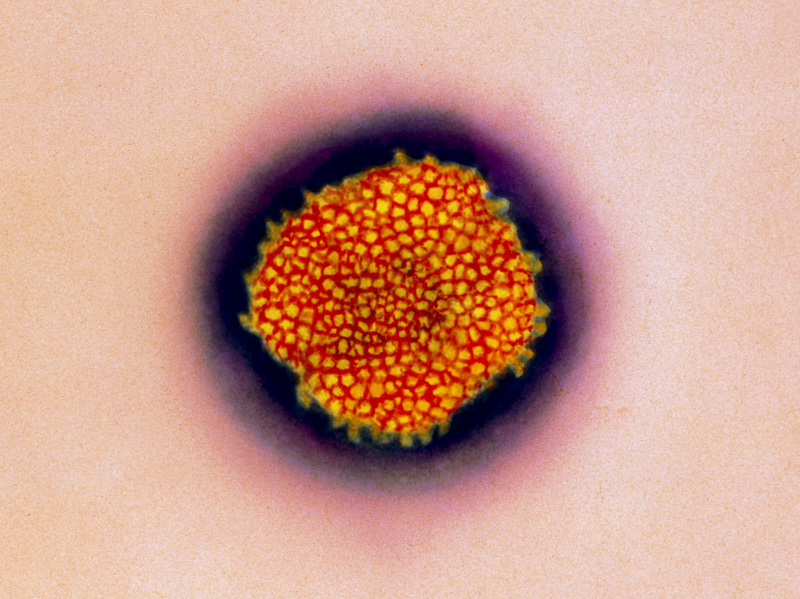 A single Lassa fever virus particle, stained to show surface spikes — they're yellow — that help the virus infect its host cells. Lassa fever can cause internal bleeding. Other symptoms include respiratory distress, vomiting, facial swelling, and back and abdominal pain. Dr. Tom Frieden, who heads the Centers for Disease Control and Prevention, says the virus is not nearly as deadly as Ebola. Ninety-nine percent of people with Lassa fever survive. "It's not that rare a disease in West Africa," says Frieden. "One in six hospitalized patients may have Lassa." The virus hardly ever makes its way to the United States. But it did on May 17, when a man returning from Liberia by way of Morocco landed at John F. Kennedy International Airport in New York. He fell ill a few days later and went to a hospital in New Jersey. Frieden says the patient was sent home. A few days later he returned to the hospital feeling worse. Initially, Frieden says, the patient was asked if he'd been to West Africa and he said no. Doctors later learned the man had traveled to Liberia. According to Frieden, he was a frequent visitor because he worked in the mining industry. So they suspected he might have Lassa fever and sent him to an isolation facility that had been equipped to assess patients who might have Ebola. By Monday morning, the CDC had run tests that confirmed that the man had Lassa fever, not Ebola. That night he died of the disease. The CDC is now helping state and local health officials track people who may have come into contact with the man's blood or secretions and keep an eye on them for 21 days as a precaution. The likelihood that he spread Lassa fever is "low at this point," says Frieden, "but it's not zero." Yet in this age of global travel, there are no sure things. "That's why it's so important to strengthen our infection control in this country," says Frieden, "and our efforts around the world to find, stop and prevent health threats from spreading."